Dear Jaslyn, thank you for your reply. Those are very helpful information. It is so nice of you to point out and recommend to me the locations and the respective departments to contact although it is not under your job scope. To me, I find that such service is so rare these days and I really appreciate your effort. Once again, thank you so much for going the extra mile for the information provided. Have a wonderful long weekend ahead. I booked the mph at Blk 486B on Sat 15 Aug 15 for my son birthday party. And I saw that you have installed ceiling fans as part of the hall on Thurs 13 Aug 15. This is great as the hall can be quite hot in the afternoon and a welcoming feature for residents having small function with tight budget. I would like to say thanks for the good work that you have done. Keep it up! I would like to express my gratitude to Mr Henry who has done a very tremendous job of solving my problem regarding the dirty parapet and the pungent smell of my rubbish chute. Thank you so much for his prompt call to my request. Dear Ms Star, thank you very much for answering my help! This is the first time that I’ve come across a person who takes the time to phone me and tell me what the Town Council has been doing. It’s 7.30pm yesterday and you are still doing your job. If I can remember, this is the second time you phone me. Keep up the good work! Once again, thanks a lot. 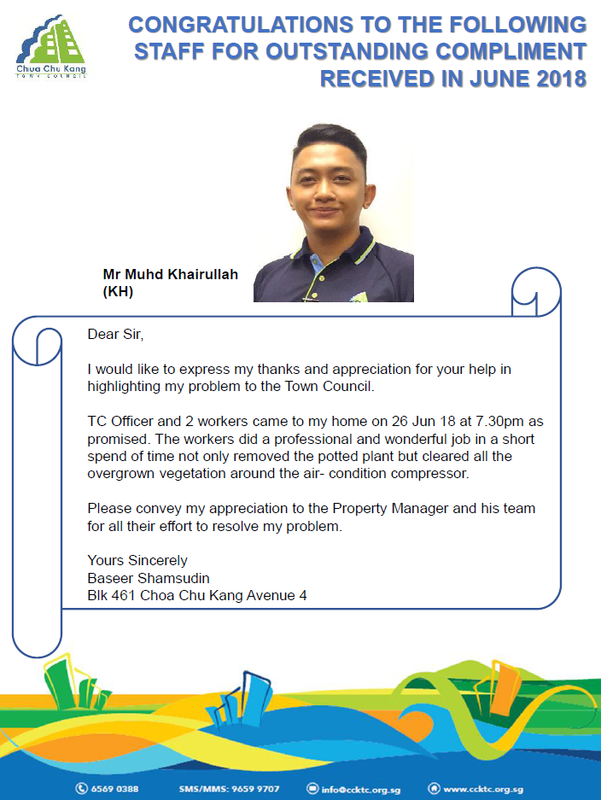 Hereby, we will like to sincerely thank one of your property officers, Mr Yaochong Cai (for RC Zone 5, Block 223 – 239 Choa Chu Kang Central), who has been very helpful, kind and patience towards our mum and us. Recently, due to some issues, we have been contacting CCKTC and he has been giving us appropriate and relevant advises, assisting us efficiently and promptly. Even, if the issues required some time to be rectified and fixed, he will take the initiative to keep us posted on the status. We will always remember his politeness and willingness to help us during our time of needs. His example is a wonderful lesson to us and hopefully to all at the respective town councils. It is our pleasure to know him and once again, please accept our sincere thanks and gratitude. I had called CCKTC regarding my wallet being dropped into the central rubbish chute at Blk 852 Jurong West St 81. I was given the foreman contact namely, Mr Salla. I would like to compliment Mr Salla for arranging his colleague, Mr Shappran to come down to the rubbish chute to help retrieve my wallet. Mr Salla was very efficient in his work. Mr Shappran had went the extra mile to open the rubbish chute and helped searched for my wallet despite the pungent smell. Thank you Mr Salla and Mr Shappran for a job well done! You guys really made my day. Thank you for getting my wallet. I would like to take this opportunity to comment on the hard work by Mr Koh Yong Ann, the Property Officer from CCKTC. He attended to my external wall seepage when I just bought over the flat and liaised with the R&R contractor in resolving the issue, thus I was able to complete my renovation and move into this lovely estate in the shortest possible time. He definitely went extra miles in attending to my complaint. I have recently found termites in my mother’s flat and contacted the Town Council for assistance. 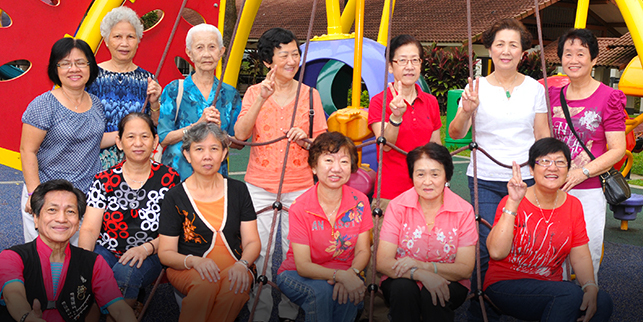 The matter was attended to by the Property Officer, Ms Star Lim, from CCKTC. I am very impressed with the way Ms Lim went about doing her work. As I am working overseas, she has been updating me regularly with the progress via email and photo attachments. This has put me at ease that the matter is being properly attended to. Through my interaction with Ms Lim, I could also see that she was working with conscientious attention to details which is sadly missing with the average person. One could sense a genuine effort on her part to conclusively resolve the problem. The conduct of Ms Lim shows our society is slowly evolving and I hope it will inspire others to give their best in anything they do. The elected politicians and the Town Council should be commended and encouraged to continue to instil such a culture within the Town Council and eventually spreading it to society at large. This is to again compliment all the staff who are involved with my case. They all have helped me in getting my father who is 90 years old to get down as the lift was under repairs. Appreciate it if you would convey my thanks to all your staff including the supervisor and cleaners at Blk 15 and the three technical staff from Fujitec who were there repairing Lift A. They have all delighted me and my family with their excellent service and prompt response to our urgent need to move my father. All the best always. Hi Jamie, thanks for all the assistance. The lightings are working well now. Great work there, by the way! Very prompt response and great execution on the ground from you and your team.